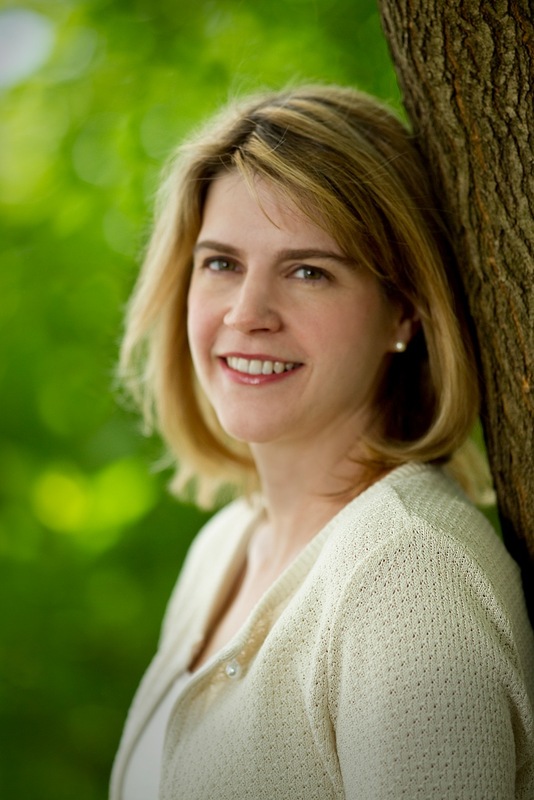 A Big Casa Welcome to DEBUT romance author, Emily Greenwood! Her first novel, A Little Night Mischief, hits stores this month! Thanks so much to my fellow Casablanca authors for having me here today to celebrate the release of my debut, A Little Night Mischief. I’m terrible at celebrating things—I wanted to hide at my own wedding—but this is so much more fun than putting on a long dress in 103-degree heat and having everyone I know looking at me at the same time. I like to think of what I write as Regency romantic comedy. A Little Night Mischief , which finaled in the Golden Heart a few years ago under a different name, is the first in my Mischief trilogy. Here’s the story in a nutshell: Felicity, the heroine, has been happily running her family estate for the last few years, so when her deadbeat uncle gambles it away to a handsome rogue, she’s not going to surrender it without a fight. But James, the new owner, has plans of his own for the estate, and there’s no way he’s going to give up his claim. The battle is on! * Felicity’s family home, Tethering, is a kooky old manor house. I love old houses, the more unusual the better, and Tethering has got quite a few quirks. From the old apple orchard behind it to the unexpected turrets atop its modest exterior and the secret passageways hidden in its walls, it’s not quite like any other house in England— which is part of why Felicity loves it so much. * One of James’s other efforts to generate money to pay the family debt involves a crumbling sherry vineyard in Spain. Interestingly, the sherry we often read about people drinking in Regency novels was generally sweetened for the English palate. The Spanish preferred “fino,” which is a dry (meaning not sweet), pale sherry. * And finally, I could be wrong, but I think A Little Night Mischief is the only current romance release with a fake ghost. :-) You just know there are going to be some midnight adventures in those secret passageways! So that’s a bit about my debut. Thanks so much for helping me celebrate! Thanks to Emily for visiting with us today! 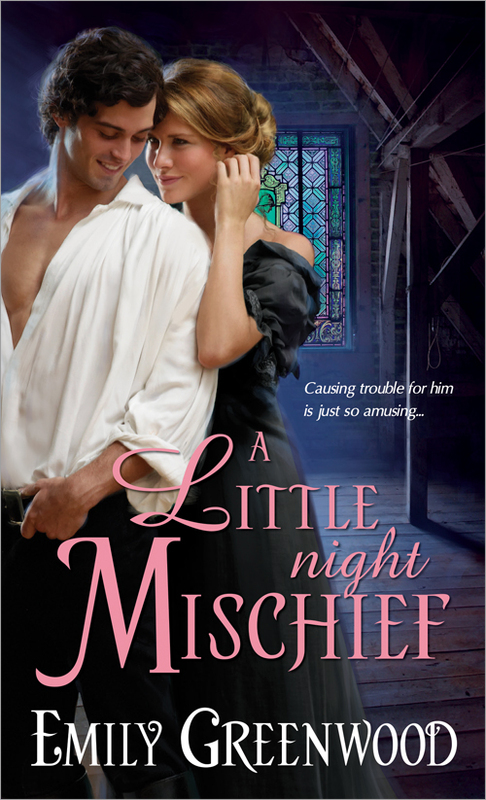 To enter to win one of two copies of A Little Night Mischief, please leave a question for Emily in the comments. Winners will be announced in the comments on Friday, June 14. Please be sure to leave an email address so we can contact you (US and Canada mailing addresses only). Emily Greenwood worked for a number of years as a writer, crafting newsletters and fundraising brochures, but she far prefers writing playful love stories set in Regency England, and she thinks romance is the chocolate—and in some exquisite cases, the wine—of literature. A Golden Heart finalist, she lives with her husband and their two daughters in Maryland. For more information, please visit http://emilygreenwood.net/. Congratulations on your debut! This sounds like a really fun read. Best of luck. Big Congratulations! Looks like you're coming out of the chute with a winner. Thank you, C.H.! I was just admiring the adorable cover of One Day in Apple Grove. I want to go to there! What a great sounding book! I can't wait to read it!! Nancy, thanks so much for stopping by! Looks fabulous! Congrats on the release. Hi Emily. Your debut release sounds wonderful. I love the cover. Congrats on your debut, Emily! As a librarian, I'm trying to get the romance librarian to purchase your book for our library! My question is, who is your favorite author (living or dead)? Congrats! Sounds like this book will be a winner. And that is one cute, eye-catching cover! Wishing you tons of success. Congrats on your debut release Emily! The 2 protagonists sound like such wonderful characters. Happily adding to wishlist. I'm all curious about the fake ghost. Betting it's the heroine trying to scare the hero away? Congratulations on your debut. I love first books :) and yours sounds like something I would enjoy. I'm sure there will be more to come but there is just something so special about that first one. Maria, thank you, and I'm excited that you're a librarian. My parents met while working in a library--we are huge library lovers! Love your question, but it's pretty tough to answer--only one author. Can I cheat and do two favorites? Charlotte Bronte and Susan Elizabeth Phillips. Amelia, thank you! Glad you stopped by. Linda, you may be on to something :-) Thanks for the warm wishes. catslady, I agree, there is something special about a first book. Thank you for stopping by the Casa blog! Congratulations on your debut novel. What was the inspiration for your story? Did you first see the characters or a piece of the plot? Oh, I love quirky homes. And there are some quirky manor houses simply because of building onto the original structures and not always in the style from that already standing. What is the quirkiest home you have visited? Congrats on the debut. Sounds like a fun read. Welcome and congratulations! I wonder what has most surprised you about getting this book into the hands of readers? Kim, I started with the plot: what if a woman lost her home to a gambler through no fault of her own and refused to surrender to what fate had done to her? Nice title. Was it hard coming up with the title? Congrats, Emily. Your book sounds like a fun read. Other commenters have asked about the new book, so how about a question about what you read when you're not writing...What are the top three books on your TBR list? bn100, it was a *little* hard. Thinking up titles is a different writing muscle for me from writing books. Not to say the books come easy either! LSUreader, thanks for your question, and I'd love to know what's in everyone else's TBR pile too. Top 3 for me right now: The Fault in Our Stars by John Green, Once Upon a Tower by Eloisa James, and What It Is Like to Go to War by Karl Marlantes. 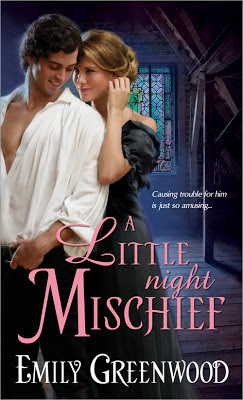 A Little Night Mischief sounds like a fantastic story and I'm definitely looking forward to reading it. I love romantic comedy so I know I'll love it. My question is, after all the excitement of your debut, what's next? Are you working on more fun stories? I hope so! I absolutely love the cover - great expressions! Did you have a say in the cover art? I am looking forward to reading your book. Congratulations! Sharlene, thanks :-) Usually authors can make some suggestions for the cover concept, but they don't have too much say in the final cover. That said, I think Sourcebooks does a wonderful job with covers! Thanks, Chelsea. Love that, "swoony"! What's the next book you have planned in the series? I am guessing that since the house is her family's home, she will be responsible for the fake ghost. When will the other books in the series be released? jmcgaugh, the next book, GENTLEMEN PREFER MISCHIEF, will be out in December. June, Thanks :-) After GENTLEMEN PREFER MISCHIEF in December, MISCHIEF BY MOONLIGHT will release next June. congratulations on your big debut. Can't wait to read it. Congratulations on debuting! When did you start writing, and how did you know this was something you want to do as a living? Thanks to everyone who commented, and to Emily for stopping by the blog!